Vintage Burlap has a background of a natural-colored burlap texture. The main font is an inline, tiny serif style which is offered in all capital letters. Flourishes set off the main text, and a small and bold sans serif letter style adds the supporting information. A chic and very popular country style. 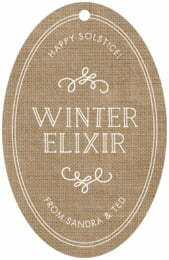 Customize your Vintage Burlap holiday gift tags today! 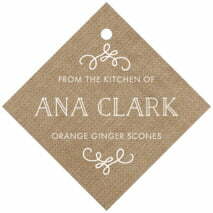 Vintage Burlap holiday gift tags are printed on extra-thick cover weight white paper and come in a variety of shapes and sizes (including square, circle, a scallop-edged circle, ovals, and other more intricate shapes). People like to use a special ribbon, baker's twine, elastic, hemp twine, or even wire to create the look they are after for the holiday presents. Holiday gift tags come pre-punched with a small round hole to thread your choice of tying material. They are punched out individually and packaged as a set in small bags. 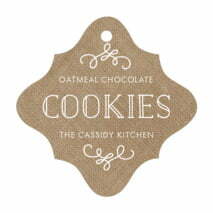 Choose a shape and color above to start customizing your Vintage Burlap holiday gift tags today!